We would like to congratulate Austin and Dylan Thomas on their commitments to Linfield College! 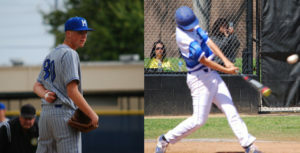 Here are Austin’s and Dylan’s recruiting story and interview after their commitments. Good luck as Wildcats! We started working with SportsForce in the spring of our junior year. Ryan and the SportsForce team were extremely helpful in evaluating film and listening to our wants and needs when deciding on a college. The team was very helpful putting us in front of college coaches that were a good fit academically, athletically and matched our financial criteria. SportForce met the unique challenge of finding a school that allowed both of us to find an opportunity to play. We will be attending Linfield College in the Fall of 2017. We selected Linfield because of their excellent academic program and it provides both my brother and I the opportunity to play baseball. Our financial needs were met, and the campus and surrounding area are what we were looking for as well. In particular, Coach Manley’s philosophy and enthusiasm was very compelling and made Linfield the best choice for my brother and me. 3. How did SportsForce help in the process?Ryan and the SportsForce team were extremely helpful in the recruiting process. Through our numerous conversations with Ryan, he got to know us personally and helped create a list of schools that he felt were a good match. SportsForce met the unique challenge of finding a school that provided the opportunity for both my brother and me to play together. 4.What advice would you give to other players and parents with the recruiting process (ex. start early, get a highlight video)? It is never too early to start the recruiting process. It is important to get an objective and honest evaluation about your talent level and be sure to focus on schools that fit your academic and athletic needs. We are very excited to begin our college career as a Linfield Wildcat. We look forward to leaving home and being more independent as well. I would highly recommend using SportsForce for your recruiting needs. They take the time to get to know you, understand your wants and needs, and help tailor your college choices to schools that meet these needs and provide a good talent fit. 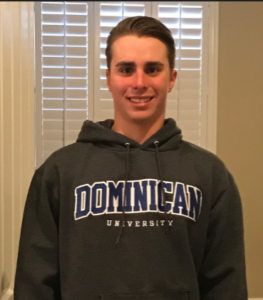 We would like to congratulate Hayden Cochran on his commitment to Dominican University! Here is Hayden’s recruiting story and interview after his commitment. Good luck as a Star! My recruiting process was much easier than I ever could have expected. The process with Dominican University took about 2 and a half months and everything was made very easy for me. I committed on February 13th, 2017 and will sign this coming April. I am going to attend Dominican University. I choose them for many reasons, one being that there is already a number of Vegas ballplayers attending the school and they all seem to love it. Second, I also found a lot of joy in the dorm rooms and campus. The surrounding area of the school is cloaked in trees making it a great place to live. Sportsforce is the only reason I found this school. They helped me get in contact with college coaches and were able to assist me in connecting with the coaches at Dominican. I more than likely would not be where I am without the help. One of the biggest things I found to be helpful was getting a video and game footage out as soon as you sign up with Sportsforce. This helps coaches that cannot travel to see you play in person, get a good idea of your skills. I am beyond excited, think about it every day. My family should save about $78,000 over a 4 year span. I strongly recommend SportsForce to any athlete of any sport. They work around the clock to get you into a school that is the perfect fit for you. We at Sportsforce would like to congratulate Tyler Kleva on his commitment to Trine University. Here is Tyler’s recruiting story and interview after his commitment. Good luck as a Thunder! The recruiting process was long and a little stressful. SportForce was instrumental in guiding me through the process. Once the initial campaign was put into action, I started receiving email replies from college coaches immediately. I received many emails from different schools, most of them inviting me to camps or their showcases. It was tough to decide which camps to attend and which camps were just moneymakers for the baseball programs. It wasn’t possible to attend them all, so I just decided to attend the ones that were near home or the schools I was really interested in attending. When I first started this process, I really had no idea what to expect and was just hoping to find the right fit to continue my education and athletic career. The process ended when I committed to Trine University on February 16, 2017. 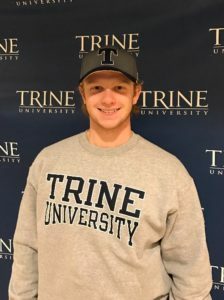 I am going to Trine University in Angola, IN, because it best fits my criteria of location, size, academics and baseball. I feel it is the best fit for me. The baseball coach played a roll in my decision as well. He came to watch me play several times, called to check on me, and basically showed a genuine interest in me. I could tell he was recruiting me for baseball, but more importantly, he was recruiting me as a person. We developed a very good relationship during this process and this was a big part of my decision to attend Trine University. SportsForce helped me with this process in many ways: from initial contact, through my commitment, SportsForce was sitting alongside guiding me through every step. The online tutorials were helpful with shooting video and developing the recruiting profile. Helping us contact college coaches was key for the initial communication process, then it was up to me to follow up with the schools that expressed interest in me. SportsForce has developed the system for student-athlete recruitment; one just needs to follow the system for success. I recommend to future clients of SportsForce, to start the process early in their freshman, sophomore or junior year of high school. For some, the process can start early, at least identifying some schools of interest. I would also recommend staying calm throughout the process and having realistic expectations. Not every athlete is DI caliber. Find a school that best fits your needs and then worry about the athletic portion. The recruitment process is a marathon, not a sprint. Enjoy the process, visit schools, communicate with the coaches and find what is best for you – don’t worry about what offers teammates may be getting or what they are doing. Do what’s best for you! I am very excited to be continuing both my athletic and academic career at Trine University. It’s been a goal of mine for several years to play baseball in college. I am very relieved that I have found a school that fits my needs for a college. I very much look forward to beginning the next charter in my life and the next 4 years at Trine University. I would recommend SportsForce to everyone wanting to play a sport in college. It’s a very easy process that gets you maximum exposure easily and quickly. Consider SportsForce your first ever-personal manager. They will assist you in every step of the process, from creation of a profile, your recruiting video, email and phone help…. Everything is included to make the recruiting process enjoyable. I couldn’t imagine trying to do this all on my own. I owe a lot to SportsForce for achieving my goal of playing college baseball.